Winner, Business Wales Mentor 2018 Celebrating Diversity. Jo Clay, Founder & Managing Director, Empower – Be The Change. Winners, Business Wales Mentee 2018 Celebrating Diversity. & Victoria Massey, Business Wales, Mentoring Agent. The Celebrating Diversity category recognises the value of mentoring in supporting development across a range of diverse activities including education, employment and personal development. Empower – Be The Change has worked with the 4 students at St Christopher’s School since October 2016. Initially, through our empowerment programme which saw all 4 students successfully complete an ILM level 2 qualification, Level 3 sports leaders qualification and completing over 150 hours of community based volunteering. Each of the 4 received mentoring support from Jo Clay and based on their positive response to this the students were selected to take part in our mentor programme which started in September 2017. St Christopher’s school is the largest special needs school in Wales and the students we have been working with all struggle with mild/moderate learning disabilities. For these students reading and writing is a real challenge. To complete assignments and other written work takes much longer and is much more challenging as compared to main stream pupils. Added to this the pupils suffer from low self confidence and low self belief. Aspirations are low as the students do not believe they have the skills and talents to enter further education and/or pursue the career they have a passion for. The 4 students nominated, successfully completed their sports leaders level 2 and along with 10 other peers were selected to take part in our Empowerment Programme. All 14 students successfully completed the ILM qualification and took up community volunteer placements. However, the 4 students nominated went above and beyond and demonstrated a high degree of commitment, enthusiasm and motivation to not only complete the courses but to support their peers to do the same. The students sourced their own volunteer placements, contacted the lead for each club and took themselves to weekly sessions to support the club junior sports sessions. All 4 exceeded the minimum 15 volunteer hours with one of the students completing nearly 80 hours. All became key members of the community clubs they supported and have received high praise from these organisations for their work. Throughout this programme all 4 received mentoring support from Jo Clay, the school and community club where they volunteered. At each session they responded well to feedback (which was sometimes challenging) and made positive changes which not only changed their outlook but inspired other pupils at the school to do the same. Based on their positive can do approach the 4 students were selected to take part in our mentor programme. The students were selected based on their maturity and natural leadership skills. The sessions were delivered at Glyndwr University which relied on commitment, maturity and responsibility of the students to manage their own learning. This is the first time the school have allowed students to attend a course off school site without school staff supervision. In total, the students attended 6 sessions and between each one were tasked with using their new knowledge and skills to support their peers through the sports leaders qualification. The students received mentoring support following each session and were encouraged to reflect, plan and evaluate their new role as mentors. The mentoring they have undertaken with their peers has been very well received and has inspired their peers of what can be achieved. The students have now completed the course content and have been tasked with writing a minimum 1500 word assignment to gain the ILM qualification. Again this is wholly reliant on the students taking full control of their learning and seeking additional mentoring support as and when they need it. The students have grown considerably in confidence and have far greater self belief. They realise they have many skills and are able to use these effectively to support their peers to realise their potential. Scott, Winner of the Mentee of the Year, St Christopher’s School. Each of the students is clear about their long term plans and through the mentoring support they have received they now all want to be in roles where they will be able to mentor others. Notably one of the students who was attacked outside of school (in July 2016) and fearful of going out has rebuilt his confidence and now actively seeks opportunities to support others. 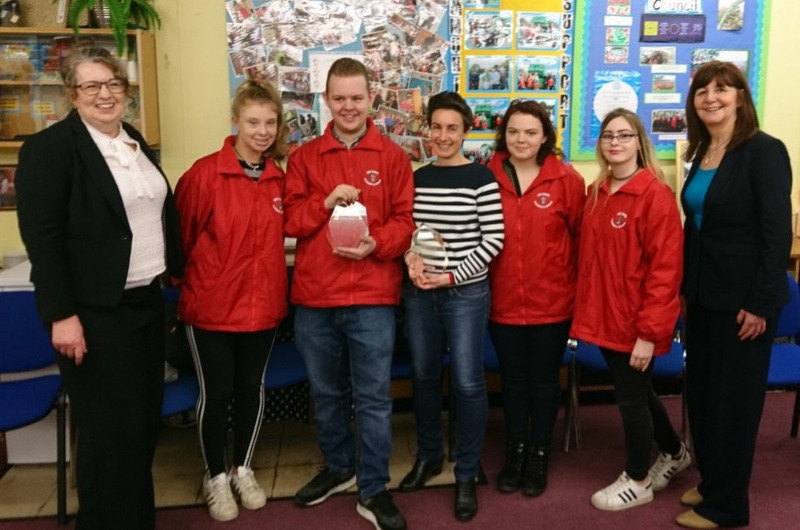 One student won the Lidl play more football award based on their sports leadership work and another the Diana Award for her commitment to volunteering despite additional pressures from home as the main carer for her parents and siblings. All 4 have become well respected and recognised role models for their peers and continue to receive recognition from a number of national organisations. This project is a first for the school and senior staff members have highly praised the work of these students. They have responded far beyond expectation to the opportunities presented to them and the mentoring support they have received. It is fitting recognition for the 4 to be recognised through this award. The success with this project has inspired and led Empower – Be The Change to roll out this programme to many groups across North Wales and has played a major part in the company’s success to date. To date we have empowered over 150 people through our programmes and have ambitious plans to empower over 1000 people by 2022. Mentoring is integral to what we do and we now encourage every participant on our programmes to become mentors to their friends, family members, peers and colleagues.